Philippe de France, Duke of Orleans, and brother to King Louis XIV was, as usual, out all night partying with unseemly types -- his identity half-hidden -- at the Marché des Innocents one night in 1662. He made it back to Versailles at the light of day and was immediately told he had been called by his brother, the King. What does this have to do with a pair of red high heels? You'll see. He needed to change because the Marché des Innocents was the precursor to what later became Les Halles, until recently the marketplace for all of Paris -- a seedy, gritty, dirty place where the blood from the butchers was known to run along the ground. The backrooms were occupied by shady card games, and liquor, and prostitutes. Philippe changed his clothes, but he didn't have time to change his shoes. He ran across the courtyards and through the palace in the shoes he had worn all night, the heels stained red by the blood. The next day, when he showed up at some courtly function, nearly everybody was wearing shoes with the heels dyed red. He didn't even know why until he asked one of the noblemen and was told, "It's because of you, and the shoes you wore yesterday." I guess everybody thought, "If it's good enough for the King's brother, it's good enough for me." From then on, to have "les talons rouges" ("red heels") was a way of expressing that somebody was of high birth. I guess it's closest English equivalent would be "born with a silver spoon in his mouth" or, possibly, "blue-blood." The expression isn't used much today, possibly because today's red heels don't send quite the same message. Boulette d'Avesnes is, in theory, a little ball from Avesnes. I know; it doesn't look like much of a ball. But it is from Avesnes, which is in the North of France. 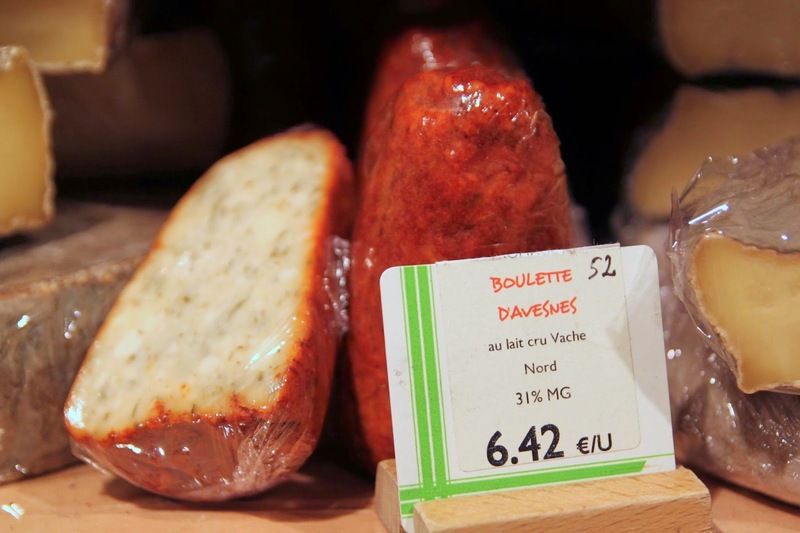 As Maroilles was being made, the pieces that didn't come out of the mold properly were mashed up with herbs -- tarragon, parsley, and peppercorn -- and then hand-formed into these cheeses. I've already talked about the white version of this, and this is basically the same cheese but coated with paprika. It has a pasty consistency, closer to a muffin than a cheese. Can I be judgmental and say it's weird? It's weird. And the flavor of the white interior is not, frankly, helped by the pepper. It doesn't add spice so much as that sort of old-pantry-spice-paprika flavor. And too much of it. Can I be judgmental and say it's not very good? Well, at least I don't like it. It must be liked by somebody, because it's a fairly commonly sold cheese. I'm told it goes well with beer, but since I don't like beer, I'm not going to find out. It is a very pretty and unusual looking cheese; I'll grant you that. This cheese is not just red, it's really red. Blood red, even. And while it's named a "boulette" ("a little ball") and in theory is shaped into a ball, every time I see it, it's pointy and pretty much looks like the shape of a high heel.